21 Dec, 2014 Rakesh Sharma Reviews . 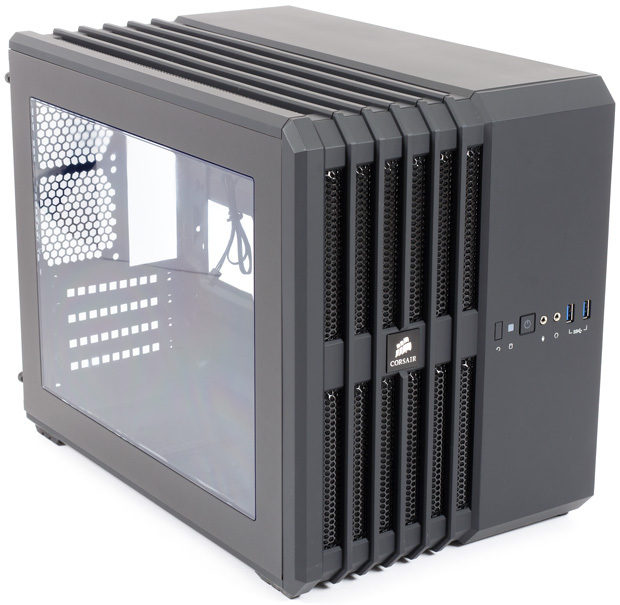 Many compact cabinets have taken the market and those with common designs are slowly disappearing, but Corsair Carbide AIR 540 Case has been really successful with innovative designs and lot of features for enthusiasts, especially with the two chamber components layout inside the cabinet. Today, I am reviewing the latest or the small brother of the Air 540, the Corsair Carbide AIR 240 cabinet. A small cube-shaped two chamber enclosure supports many ITX to m-ATX motherboards still having a mid tower case worth of space inside in a compact format. Allowing long and multiple graphics cards support with lot of airflow to keep them running cool. Corsair Carbide AIR 240 provides flexibility of installing a good air cooling or all in one or even a fully customized water cooling setup, giving you lot of cable management options without taking up too much space on your deck or beside your computer table, plus a windowed side panel, which lets you show off your hardware. And most important supporting full size power supply unit not the small format PSU. Most loving part is that the case can operate in a traditional PC orientation with the windowed panel to the left or windowed panel on the top in a HTPC style alone side your Home audio-video setup. Now let’s have a look on what features does AIR 240 have for us. Direct Airflow path cooling - The unusual interior design is optimized to allow the intake fans to deliver cool air directly to your components that generate the most heat. Mini-ITX and MicroATX support in a compact size - Although it’s the same size as many Mini-ITX cases, the Air 240 supports MicroATX motherboards. This gives you the option of installing dual GPUs. Easy installation and upgrades - Tool-free 3.5” drive, 2.5” drive, and side panel removal means that builds and upgrades can be performed without reaching for a screwdriver. The CPU backplate cutout allows you to upgrade your CPU cooler without taking out the motherboard. Outstanding liquid cooling radiator support - The Air 240 has pre-spaced holes for 240mm radiators on the top, bottom, and front. If you’re using a Mini-ITX motherboard, you can add both front and bottom 240mm radiators. If you’re using a MicroATX motherboard with dual GPUs, you can install a front 240mm radiator. Flexible installation - The flexibility goes beyond dual Mini-ITX and MicroATX compatibility. The included rubber feet can be placed on any of three surfaces, so you can customize the orientation of the chassis: as a standard tower, an inverted tower, or as a desktop. Full side panel window - The panoramic window allows you to admire your work. Build a clean, uncluttered system - The Air 240 has cable routing holes with grommets and tie-downs, with dedicated cable housing space behind the motherboard tray. It’s easy to move your cables out of the way and out of the airflow path. Front panel USB 3.0 ports - Up-front connectors make it easy to attach USB flash drives, portable hard drives, and USB headsets.